Ideally, Sunday's are the perfect time to spend all day in the kitchen crafting the perfect supper. However, more often than not, you are spending your Sunday getting ready for the week ahead by doing laundry, going grocery shopping, and making school lunch for the next day. On your busiest Sunday's, you need a meal like quick baked gnocchi with chicken, ready on the back burner. Tender Italian potato dumplings are baked with a creamy Alfredo sauce, chicken, bacon and vegetables and topped with copious amounts of mozzarella cheese and parmesan cheese. This is a great recipe to use leftover chicken from the dinner the night before. This versatile easy dish will make Sunday dinner a snap to prepare. Bring a large pot of water to a boil. Cook the gnocchi according to the package directions. Drain. Meanwhile, wrap the spinach in a kitchen towel (one that you don't mind being stained green) and wring it out to drain any excess liquid. You might have to do this a couple of times. In a large bowl, add the jarred Alfredo sauce, cooked gnocchi, spinach, bacon, and cooked chicken. Stir all the ingredients until well combined. Spoon the mixture into a casserole dish. Top with both the mozzarella cheese and parmesan cheese. Bake the gnocchi for 20-25 minutes until the cheese has melted and begun to brown. Serve immediately. 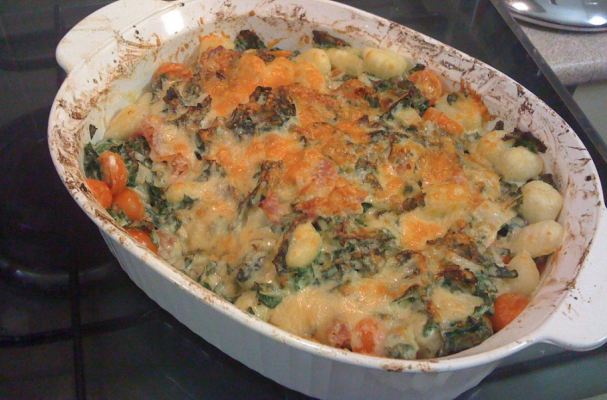 Note: You can make several delicious variations of this gnocchi casserole. For example, you can bake the gnocchi with your favorite marinara sauce or substitute the spinach for other vegetables like broccoli or spinach. Sweet potato gnocchi is also a nice option for a fall inspired casserole with sage and butternut squash. Second Note: If you're short on time, you can heat the Alfredo sauce in a saucepan, toss in the other ingredients and serve the dish as is, without baking it. I would hold off on the mozzarella cheese and serve with just a sprinkling of parmesan.